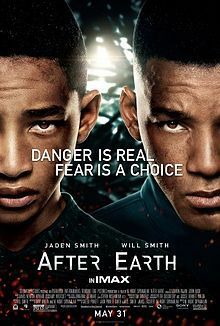 Set in the thirty-fist century, After Earth is about a cadet called Kitai (Jaden Smith), who is training to become a member of the Ranger Corps. The Ranger Corps is a military unit that developed a thousand years ago after humans were forced to evacuate Earth; their sole purpose: to protect humanity. No easy job, considering that they are constantly under attack by the Ursa, a savage creature engineered to kill. Although they are blind, they can smell fear, and will hunt you down. So when Kitai, and his farther, Cypher (Will Smith), crash land on their former home planet, he has to put his fear aside in order to survive. After a tragic incident in his youth, Kitai believes that his father considers him a disappointment and a coward. Cypher says 'fear is a choice' that 'fear is insanity', something which I think is the wrong message to be sending out in a film. Indeed, it is true, animals can smell fear, and will attack when they sense it, but that does not mean fear is a bad thing. Fear can be very healthy and stop you from taking unnecessary risks. Fear is not a choice, it is a defence mechanism, and by no means makes you a coward. The main issue I had with the film was the fancy editing, such as jump and quick cuts, which I think distracted from the already backstory. Everything was relayed through a voiced-over flashback at the beginning, but it was not entirely clear. I only got a full understanding once I went to the official website to clarify things. Strangely enough, the website gave far more exposition than the film ever did. After Earth is only a hundred minutes long, so I think they could have afforded to spend a bit more time at the start, mapping the story details out. This goes the same for Kitai's training. Kitai apparently aced all his academic tests, but failed to meet the physical standards needed to become a ranger. This is incongruent with what is on screen, where Kitai is shown to be running far ahead of all his classmates. For Kitai's failure to have meant something, they really needed to spend at least one scene showing his struggles, rather than just mentioning them. Other inconsistencies include a conveniently universal anti-toxin, and Kitai's father being sucked out into space through an airlock one moment, only to be alive onboard the ship the next. The critics' main criticism of the film is Jaden Smith's acting, and while I agree, he still needs a bit of practice; at fourteen, he has plenty of time to improve. To some degree, his stunted emotional performance almost worked as a form of the character's shell shock. The plot gets a lot more interesting once they crash land on Earth. With his father injured, it is up to Kitai to locate the distress beacon, which is somewhere out in the wilderness. He is chased by baboons, attacked by lions, and sucked by leeches, all on a mission for survival. After Earth is not an outstanding film, but neither is it the train wreck critics have made it out to be; it is definitely worth seeing.